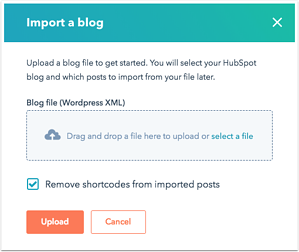 One of the most common challenges facing companies that move their blogs from WordPress to HubSpot is the actual process of blog migration and getting all of that content that they've created over the years onto a new platform in a way that is fast and error-free. In short -- No, we’ve got you covered! The best part is that anyone can do it. It’s fast. It’s easy. And there’s no need to get a developer involved unless something goes really wrong. And as you'll see, even if it does, there's always a recourse. After you’ve signed into your WordPress site and navigated to your dashboard, mouse over the menu item on the left labeled Tools and click Export in the submenu that appears. Once you’re on the page titled Export, select the radio button for Posts and use the dropdown select fields available to filter out any content you don’t want to include. Once you’ve got that all configured the way you like, click the blue Download Export File button. If you’ve configured your browser to automatically save files to a specific location, then your new file (with a .XML extension) will be there. If not, you may be asked where you’d like to save it. 1. In the sidebar menu on the left, navigate to Website > Blog. 2. 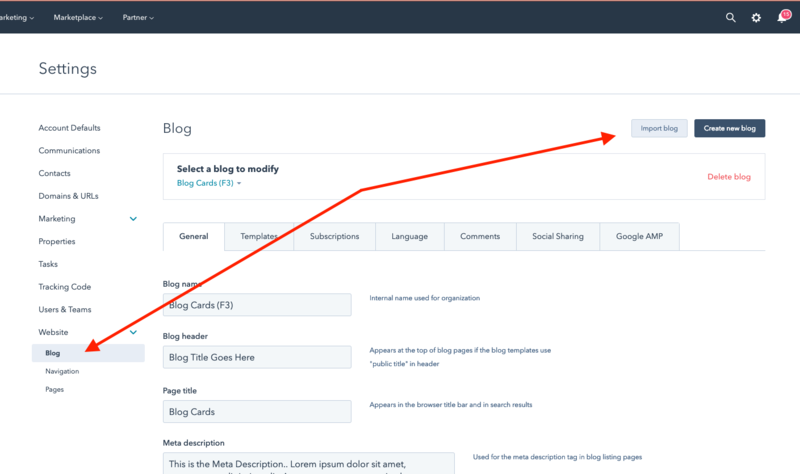 At the top of your blog settings, click the Import Blog button. 3. 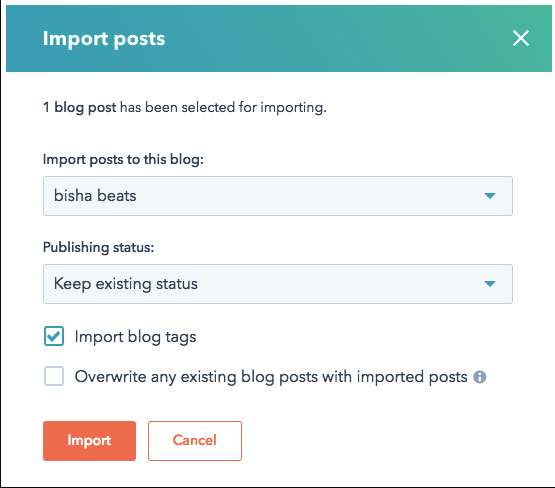 In the blog import dashboard, click Import new blog. 4. 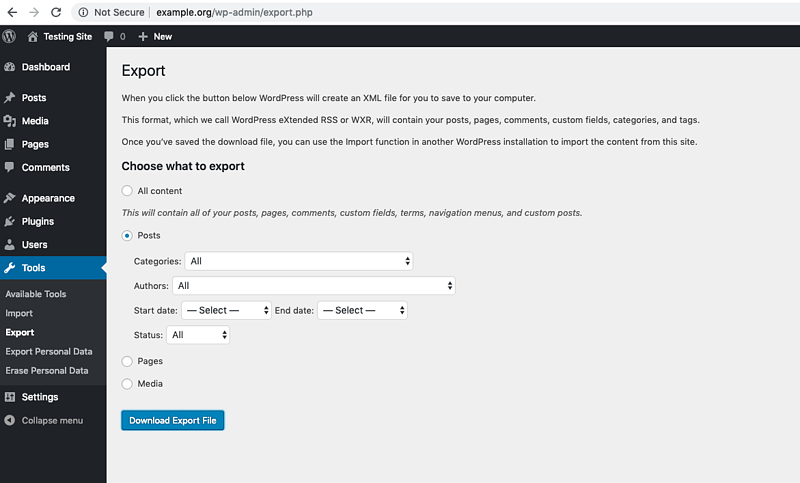 Click select a file to upload your XML file of WordPress posts, then click Upload. Pro Tip: The checkbox to Remove shortcodes from imported posts will be checked by default. On WordPress, shortcodes are a way to easily import data, forms or sections by referencing them in a different location. These codes are specific to WordPress and won’t have any value on HubSpot, so I recommend leaving that checked. Once your file has been imported, you’ll be presented with a screen that shows a table of all your posts that are pending import. If you missed any you don’t want or need, you can start by clicking the main checkbox to select them all, then uncheck the ones you’d like to omit. When you’re ready, click Import posts ( red button next to the search bar ). Next, a box will popover where you’ll select which blog the posts should live in and to what status they should be set. When I migrate content from WordPress to HubSpot, I’ll usually select Keep existing status to keep everything the same as it was on WordPress. If you used the default WordPress export functionality, then there should be no errors derived from invalidly formatted XML. If you do run into an error like this one, I’d go ahead and restart the process to make sure there wasn’t some glitch during the export. 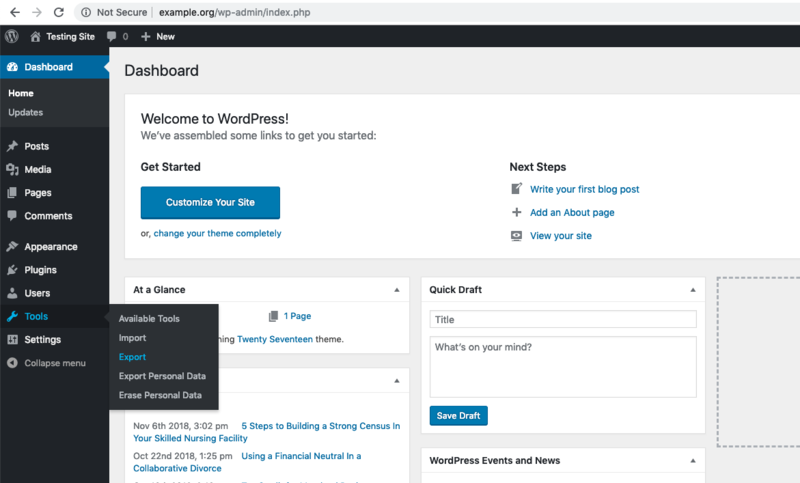 If your WordPress blog uses a plugin called Advanced Custom Fields ( ACF ) for content management and your developer has replaced the default WordPress Editor with a content field in ACF, your posts are likely going to come over with no content. Unfortunately, to fix this, you would have to go through the XML file and re-tag all of the ACF fields that hold the main content so that they’re tagged with the WordPress defaults. We’ve had only a few of these happen in the past, but I can tell you there’s no simple way to fix the issue. It’s a painstaking process. When your posts are imported, HubSpot will try and retrieve any assets ( images, linked PDFs, etc. ) from the content and bring that over too. If you had an improperly linked asset in your content, you may see this error. In this case, you’d need to fix the issue in one of two ways: you can fix the link inside the individual post on WordPress and re-export everything, or you can find the entry inside the XML file and correct it there. I’d recommend the former since XML structure can easily break and it will be hard to find anyway. Knowing how your marketing efforts perform and being able to pivot is key in any marketing plan. Fortunately, for companies that wish to pivot from WordPress to HubSpot, migrating blog content is simple, quick, and easy enough for a lay person to do on their own.